While each patient varies, many patients can now have their orthodontic treatment completed in less than a year. PROPEL comes as a sterile, ready-to-use disposable device. The device has an Adjustable Depth Dial and indicating arrow on the driver body. The Adjustable Depth Dial can be positioned to 0mm, 3mm, 5mm, and 7mm of tip depth. How do teeth move in orthodontic treatment? Forces on teeth produce pressure and tension on points either side of roots, causing remodeling of the bone and therefore, tooth movement. 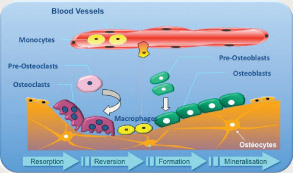 Osteoblasts and Osteoclasts are recruited to remove and add bone on the pressure and tension side of the root. The process of inflammation is necessary for this to occur. What limits the movement of teeth in orthodontic treatment? The rate of bone remodeling determines the rate at which teeth move. 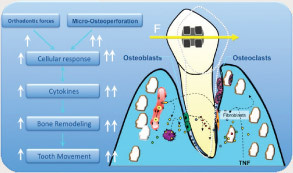 As stated, bone remodeling is an inflammatory response to orthodontic force involving the signaling cascade of cytokines to recruit and differentiate surrounding cells into Osteoblasts and Osteoclasts. The rate of bone turnover is directly correlated to the level of cytokines expressed in the area. The higher the levels of cytokines expressed the faster the bone remodels and hence the faster teeth will move. The lower the level of cytokines (ie. after taking aspirin or other anti-inflammatory meds), the slower the bone remodels and thus there is slower tooth movement. 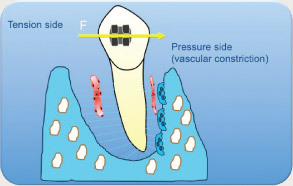 How does PROPEL affect the movement of teeth? Micro-Osteoperforations with the PROPEL device cause a localized inflammation where there is an increase blood flow and cytokine expression as part of this inflammatory response. By increasing the cytokines in the area of desired movement, bone remodeling activity greatly increases and therefore the rate of tooth movement increases as well.